Now we know everybody is under a little more pressure these days to perform and we do understand when staff get frustrated with their boss…however this one request took this rather further than expected! We are running a circus training event for a client as an alternative to their staff summer party. Something a little more unusual and they will undoubtedly have a great time. However Hellen has just received an email from one of the staff who is organising this day. Instead of stilt walking can they do knife throwing instead.!! Seriously!!! 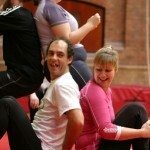 PS Interested in our Circus Skills workshop? We do a wide range of activities that fit nicely in the category of physical but not too strenuous. Although our facility is based in London, we cover mobile training sessions as stand alone events, or as part of a conference.